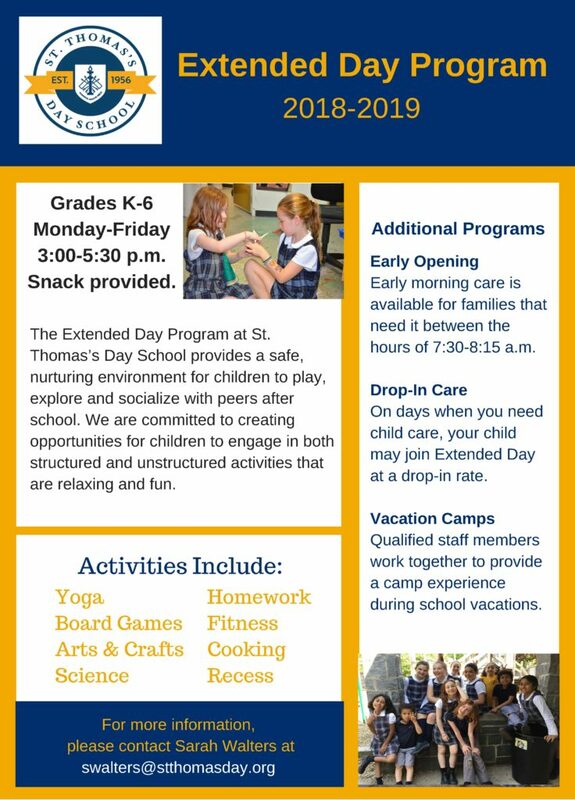 St. Thomas’s Day School offers an Extended Day Program for our students designed to enrich and inspire our children and to meet the child care needs of parents. Care is available both before and after regular school hours. Extended Day is child oriented with a combination of teacher-directed and free choice activities. This flexible program offers a wide variety of age-appropriate activities, including a fitness component, a homework period, cooking, arts and crafts and indoor/outdoor free play. Parents may sign up for full-time or part-time participation. The schedule follows our academic calendar. When the schedule allows, St. Thomas’s Day School offers a full day vacation program during winter and spring breaks as well as the week following the close of the school year in June.